In this video, Art Sellinger and Motion Golf analyze the Jamie Sadlowski swing, the RE/MAX World Long Drive Champion of 2008-2009. 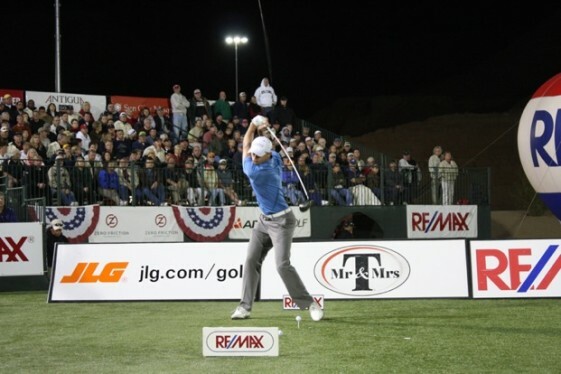 MESQUITE, NEV. –- With a towering blast of 384 yards into the cool desert air, Canadian sensation Jamie Sadlowski won the RE/MAX World Long Drive Championship for the second consecutive year at Mesquite Sports and Event Complex on Friday night. Sadlowski, a 21-year-old resident of St. Paul, Alberta, earned a $150,000 payday for his 384-351 match-play win over Jerimie Montgomery. Montgomery earned $70,000 for his runner-up finish. But even as he cemented his status at the pinnacle of power golf, Sadlowski was forced to share center stage with Long Drivers of America (LDA) Hall of Fame member Bobby Wilson. Wilson, 53, authored a new chapter in long drive history by bagging two RE/MAX world championship rings; the resident of North Little Rock, Ark., won the title in both the senior (ages 45+) and super senior (53+) divisions. Wilson pocketed $50,000 for claiming his second RE/MAX senior world title — the first came in 2004 — with a 378-OB win over Sweden’s Johan Tumba. Tumba, who collected $14,000 for his runner-up finish, earlier toppled top-seed Gerry James, 378-355, in one semifinal; in the other, Wilson squeezed past defending senior division champion Dan Boever, 358-357. Wilson had begun the evening’s festivities by defeating Pete DeBoer, 362-OB, in the super senior division final. Wilson earned $20,000, while DeBoer collected $7,000. In one of the closest encounters on the evening’s card, the third-seeded Wilson nipped second-seeded Pat Dempsey in a memorable semifinal, 370-369. DeBoer had earlier bested top-seeded and two-time defending champion Mike Gorton, 338-330. The tournament marked the 15th anniversary championship in Nevada. Power golf’s premier event was staged in Las Vegas in 1995-96, then moved to its home in Mesquite in 1997.